The Going Viral symposium program acknowledges co-sponsors UNC Gillings School of Global Public Health, UNC Institute for Global Health and Infectious Diseases, UNC Libraries, NC Museum of Natural Sciences and RTI International. 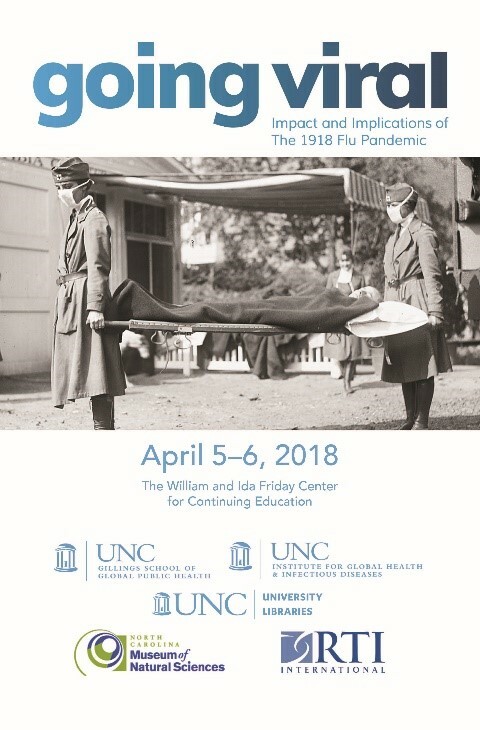 To mark the centennial of the 1918 influenza pandemic, we held a symposium, Going Viral: Impact and Implications of the 1918 Influenza Pandemic, in Chapel Hill on April 4-6. We looked back at the 1918 pandemic with a view to preventing another, creating an interdisciplinary event that brought together scholars from many fields, including literature, history, virology, epidemiology, medicine, communication and more. 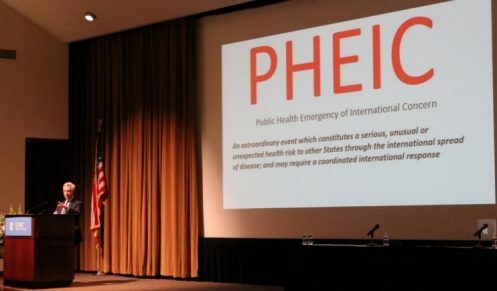 In this centennial year, there will be many meetings and events to memorialize the traumatic event that stunned the early 20th-century world – but I doubt any will be as interdisciplinary as Going Viral. 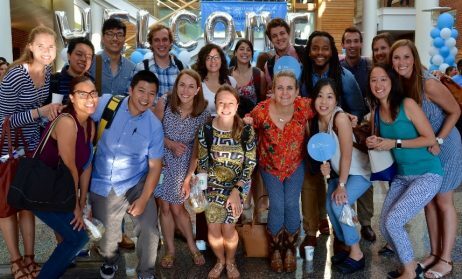 An outstanding, interdisciplinary planning committee helped us achieve that, and it was a fascinating few days. With help from University Librarian and Vice Provost for Libraries Elaine Westbrooks and the University’s North Carolina Collection Curator Bob Anthony, we began with an evening event at Wilson Special Collections Library, with music from the period and readings about the impact of the pandemic. The music and literature were moving and set the tone for the gravity of those terrifying months in 1918-1919. Kudos to student musicians and actors, dramatic art assistant professor Julia Gibson, Dr. Joe Mosnier and Elizabeth French, assistant dean for strategic initiatives in the Gillings School, for bringing the arts of the time to life. 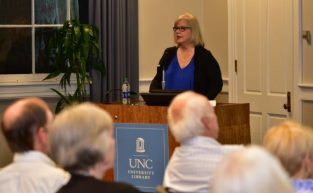 Dr. Paula Eckard described the impact of the 1918 flu in the life and literature of author and UNC alumnus Thomas Wolfe. Photo by Adrian Moreno. It was energizing to hear Dr. Paula Eckard talk about how Thomas Wolfe’s writing was influenced by his brother Ben’s gruesome death from influenza. Eckard is a Wolfe scholar and a nurse. Wolfe’s Look Homeward, Angel includes a fictional brother who dies from flu, and the death scene is narrated in an amazingly clinical manner. 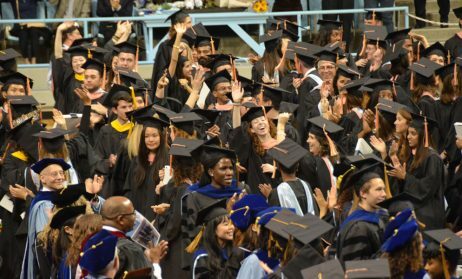 Howard Covington, Pulitzer Prize-winning journalist and historian, told us about UNC-Chapel Hill in 1918. The lack of adequate sanitary conditions on campus was consistent with the times but also hard to believe. From the windows of the library, which was built in the late 1920s, we looked out and imagined how it was a hundred years ago. On the second day, we heard from powerful speakers who represented the fields mentioned above – and more. Dr. Howard Markel told the story of the pandemic, while Dr. Jim Leloudis focused on the impact in the South. We saw haunting images of people marching in densely packed crowds to raise funds for war bonds in cities such as Philadelphia. The fact that those cities subsequently were overtaken and overpowered by influenza is a reminder of how little people knew at that time about virus spread. Philadelphia was advised not to hold the march, but it was held nevertheless. 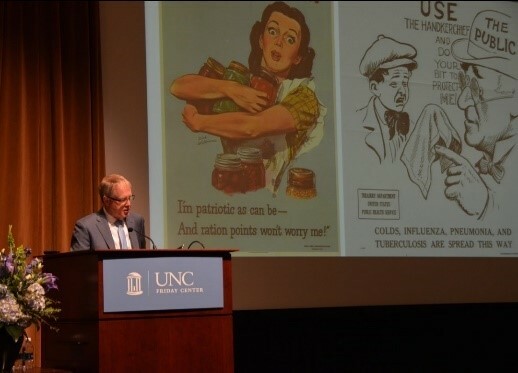 Dr. Jim Leloudis spoke about the historical context of the 1918 pandemic in North Carolina and the South. Photo by Jennie Saia. We heard from Dr. Priscilla Wald, a literary scholar who spoke about the contagion narrative, and how it affects what we know and think about infectious diseases. The New York Times science and medicine reporter Gina Kolata gave the keynote lecture and was superb, recounting stories from her best-selling book, Flu: The Story of the Great Influenza Pandemic of 1918 and the Search for the Virus that Caused It. 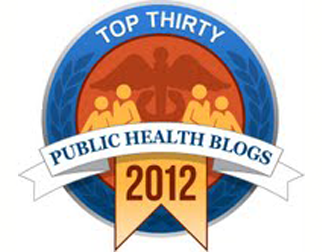 Top virologists, epidemiologists and veterinarians, including Drs. Ralph Baric, Adolfo Garcia-Sastre, Barney Graham, Fred Hayden, Yoshihiro Kawaoka and Barrett Slenning, addressed topics that included universal influenza vaccines, next-generation antivirals, and the interconnection between animal and human health. Dr. Tom Frieden, former Centers for Disease Control and Prevention director and now president of Resolve to Save Lives, came to us via teleconference from India. 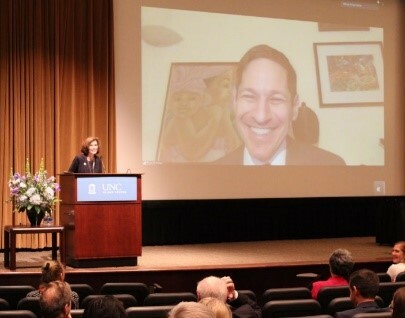 Dr. Leah Devlin moderated a session in which Dr. Tom Frieden spoke from Delhi, India. Photo by Jennie Saia. Dr. Martin Meltzer presented the striking cost of pandemics. Dr. John Brownstein showed us how digital tools and citizen science are being used in pandemic surveillance, prevention and preparedness. His and several other talks are accessible via our website. We also discussed how to communicate about influenza and the ethics around pandemics. We covered many practical issues of readiness and response and had a session devoted to minority populations. Dr. Adriane Lentz-Smith, author of Freedom Struggles: African Americans and World War I, talked about the experience of black soldiers during and following WWI, and Dr. Sandra Crouse Quinn helped us understand why minority populations have less trust in vaccination – and what can be done about it. 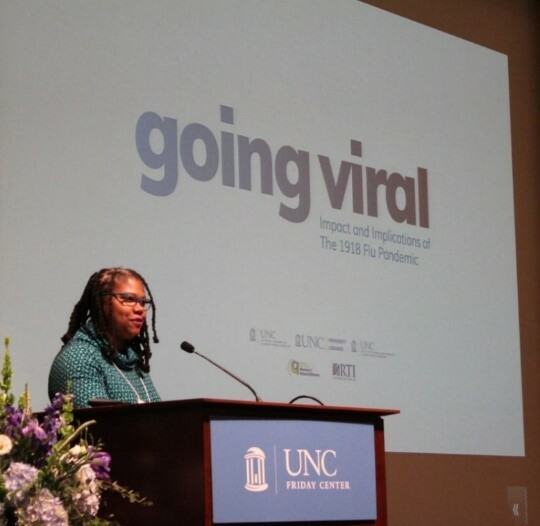 Saturday, we partnered with the N.C. Museum of Natural Sciences for a public-facing event focused on Going Viral. It was truly awesome to be in a museum with throngs of people, an incredibly diverse crowd. 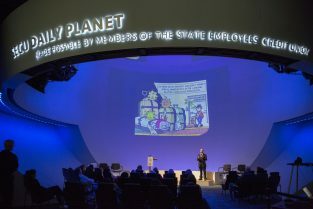 While some faculty members gave mini-talks in the three-story Daily Planet theater, students and others hosted tables. Dr. David Weber gave a talk on infectious diseases, including influenza, in the museum’s Daily Planet theater. Photo by Karen Swain/NCMNS. At the North Carolina Museum of Natural Sciences’ public-facing Going Viral event, Gillings School student government co-president Katherine Gora Combs explained how viruses and other infections spread. Photo by Karen Swain/NCMNS. Dr. Joe Mosnier led students and faculty member Dr. Rohit Ramaswamy (speaking from South Africa) in a reading of poems from Ellen Bryant Voigt’s, Kyrie, a collection of sonnets about the devastation and tragedy of the pandemic. The epigraph for Kyrie: Poems is a quotation from Alfred Cosby’s The Forgotten Pandemic: The Influenza of 1918 – “Nothing else – no infection, no war, no famine – has ever killed so many in as short a period.” Speaking through many narrators, Voigt evokes the great epidemic through the eyes and experience of various Americans – a soldier, his fiancée, orphaned children, a doctor and a host of grieving family members.
. . . at the window, / every afternoon, toward the horizon, / a little more light before the darkness fell. (p. 55). 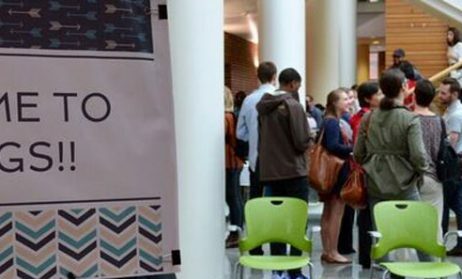 Below are a few more photos from the symposium, and many more are available here. 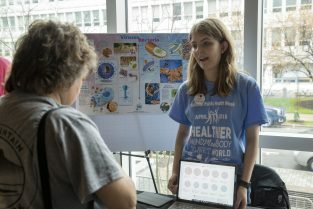 Additional photos from the NC Museum of Natural Sciences’ Going Viral event are here. 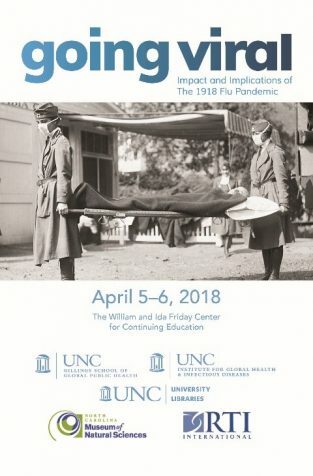 A virtual exhibit on the 1918 flu pandemic, developed by UNC-Chapel Hill’s University Libraries to coincide with the symposium, is here. We’ve also created a web page for sharing stories and recollections about the pandemic and hope you’ll visit it, read some of the moving submissions and share something of your own family’s or community’s experience. Dr. Adriane Lentz-Smith described the experiences of African-American soldiers during and after WWI. Photo by Jennie Saia. 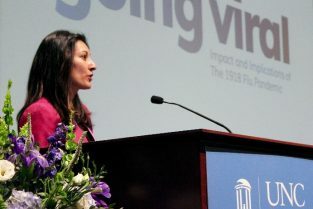 Dr. Nandita Mani moderated a session on what we have learned from prior epidemics and pandemics. Photo by Branson Moore. Dr. Bruce Gellin discussed the intersection of global health and global health security in pandemic influenza. Photo by Branson Moore.